Watch a video about an early flying experiment of Orville and Wilbur Wright. See light bulbs invented by Joseph Swan and Thomas Edison. Quick facts about Thomas Edison. Listen to a recording for a talking doll made by Thomas Edison in 1888. Watch a video about the invention of some things we use every day. Build an invention or find out about some young inventors. Play some games and find out more about inventing. An A to Z guide to inventions and inventors. More about everyday inventions and their inventors. Over 60 flaps to lift to discover the wonderful, mysterious and often funny stories behind some of the world’s most ground-breaking inventions. Featuring eye-catching illustrations, quirky facts, and surprises such as flaps within flaps. With internet links to websites to find out more and design your own inventions. There’s a lot to be said for flaps. They draw out curiosity (who wouldn’t want to know what is hidden behind a flap), they introduce drama to reading (what’s going to be revealed…?) 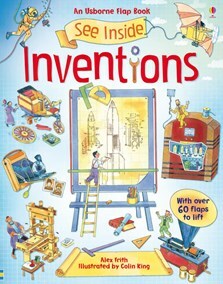 and they keep hands busy (great if your reader isn’t one who likes to sit still), so See Inside Inventions was already looking like a winner, even before we started reading... when we did start reading, we loved the book even more. Find out more about the world's most fascinating and funny inventions. I absolutely loved the interactivity of this ‘lift the flaps’ book... What’s more it is not just a parade of facts – we find out about people and the history behind the inventions, essential context to make the science interesting. Famous inventions often come about for strange reasons and this book shows how things were invented, often by chance, such as the sticky burrs on a dog's coat that led to the introduction of velcro.. Lift the flaps (over 60 of them) to reveal intricate drawings which show the hidden workings inside inventions. Engines, flying machines, electricity and more - all explained in easy-to-understand language. I would recommend this book. I liked the flaps and pictures. The information was interesting. Some of it I already knew, but there was lots I didn’t. I liked reading about the Swiss engineer who invented Velcro. He got the idea from the burrs that stuck to his dog.